OK, so this past weekend in Houston it was in the 70’s and I wore capris. Apparently we could see snow flurries by the end of this week! So to celebrate the cold weather (because yes, I like cold weather in winter – call me crazy) I decided to make some warm Chili. I have this cookbook that I love called Celebrate! by Shelia Lukins, its awesome! 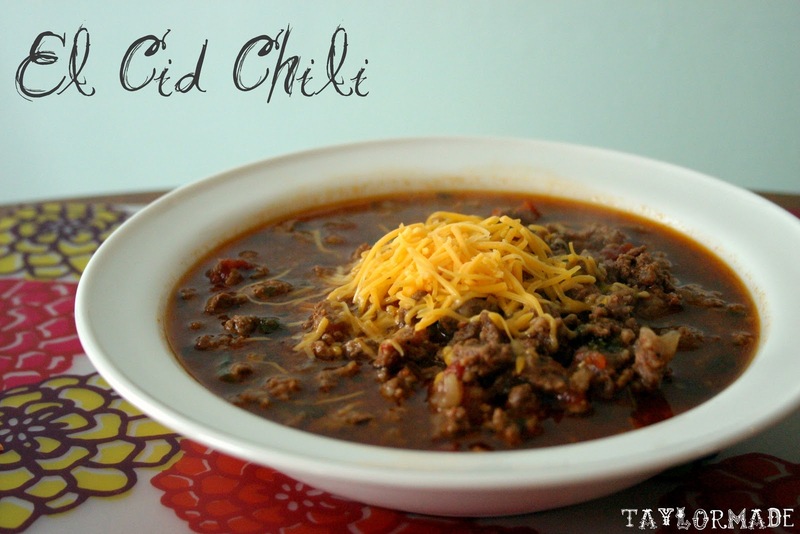 It’s set up by occasion like Easter, Vday, Mother’s Day… so this recipe for Chili came from the “Superbowl” section. It’s called El Cid Chili and its Amazing! It doesn’t call for any beans or extras; just the meat, tomatoes and spices. Add some shredded cheese and green onion on top and you are ready for these “Houston Snow Flurries”. Place oil in a large, heavy pot over medium heat. Brown the sirloin in batches. Remove to a bowl with a slotted spoon. Add ground beef, chorizo (or sausage- I’m not brave enough for chorizo) and onions to the pot and brown. Make sure to break up the meat. Return sirloin to the pot. Stir in remaining ingredients, except for garnishes. Bring to a boil, reduce heat, simmer for 2 hours. Stir occasionally, breaking up tomatoes. Before serving, discard cinnamon stick, bay leaves and jalapenos.